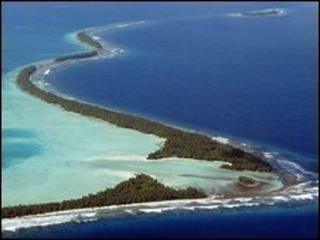 A new geological study has shown that many low-lying Pacific islands are growing, not sinking. One of the authors of the study, featured in the magazine the New Scientist, predicts that the islands will still be there in 100 years' time. Using historical photographs and satellite imaging, the geologists found that 80% of the islands had either remained the same or got larger - in some cases, dramatically so. "That rather gloomy prognosis for these nations is incorrect," he said. "We have now got the evidence to suggest that the physical foundation of these countries will still be there in 100 years, so they perhaps do not need to flee their country." One scientist in Kiribati said that people should not be lulled into thinking that inundation and coastal erosion were not a major threat.